The remains of the lobby show the three floor parking structure on the left. 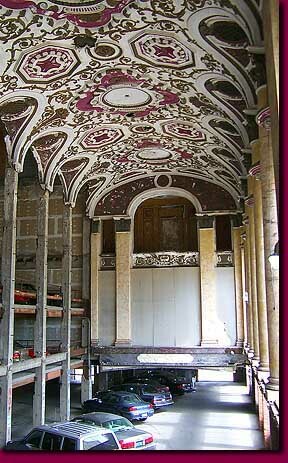 Above the ceiling are the intact remains of the balcony. Like many theaters of its era, the Michigan Theater was not a standalone structure, but part of a larger office building, the Michigan Building. While the theater died by 1976, the office building continues to be largely occupied and is a viable part of the downtownn business community. Its survival no doubt was enhanced by the gutting and sacrificing its elegant theater on the altar of the automobile.